Sparkling mango lemonade is a fun, fizzy beverage you'll want to drink all summer long. It's completely customizable to your own tastes -- make it sweeter or more tart, or spike it with a splash of vodka! If you love food, we're your people. Nothing says “summer” to me than my first batch of homemade lemonade. Mind you, I did NOT grow up drinking anything resembling homemade lemonade. The powdered mix stuff was where lemonade began and ended, and hey, it was delicious. But somewhere along the line, that stuff started giving me a sore throat every single time I drank it. While the first sip of ice cold lemony goodness makes the thought of a future sore throat seem worth it, I knew there had to be a better way. I started homemade lemonade-making last summer, and haven’t looked back since. I love them because you know exactly what ingredients are going into them, and you can create just about any flavor combination you’re in the mood for. You can also customize the sweetness level to meet your own personal taste. I like more tart, less sweet lemonade, so that’s what I make for myself. If I know I’ll be serving guests, I’ll make a little extra simple syrup (the sugar solution that sweetens my homemade lemonades) and add that to the pitcher for more crowd-pleasing sweet lemonade. This sparkling mango lemonade was my first batch of lemonade for Summer 2015, and I think it might be my most favorite homemade lemonade ever. You basically create a mango-lemon juice concentrate by blending chopped fresh mango and lemon juice. 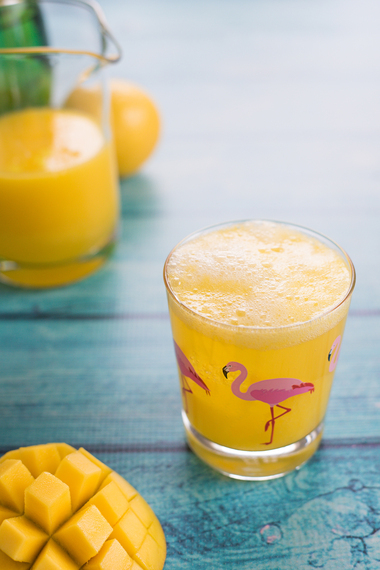 If frozen mango chunks are easier for you, use those! Lemonade shouldn’t stress you out. 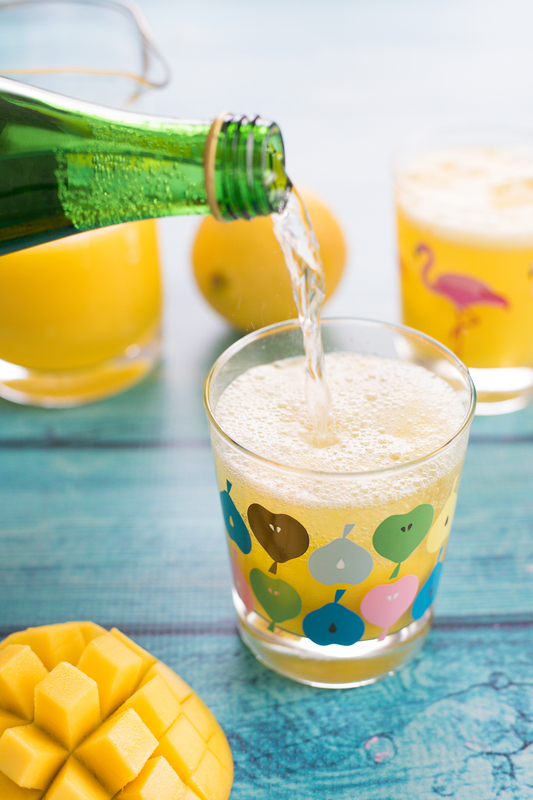 Sweeten the mango concentrate with simple syrup, and top everything off with lemon-flavored sparkling water. It’s fizzy and fun, and is pretty great with a splash of vodka, if you’re into that sort of thing. Not that I’ve tried it. Just kidding, I’ve totally tried it. It was awesome. You could also try a different flavor of sparkling water for this. 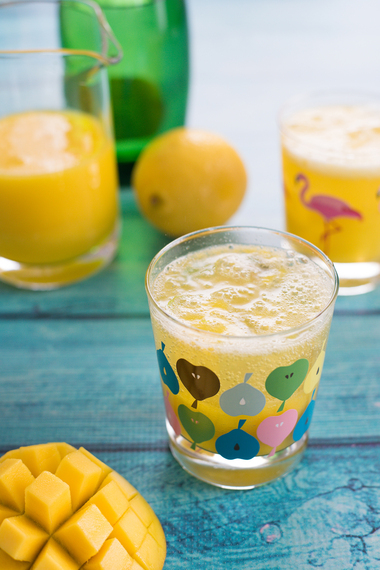 Go with lime sparkling water for a sparkling mango lime lemonade. Limeade? Lemon-limeade? I don’t know, you figure out the name yourself. I’m just here to create recipes, not name them. Make this summer the year of homemade lemonades! Enjoy! 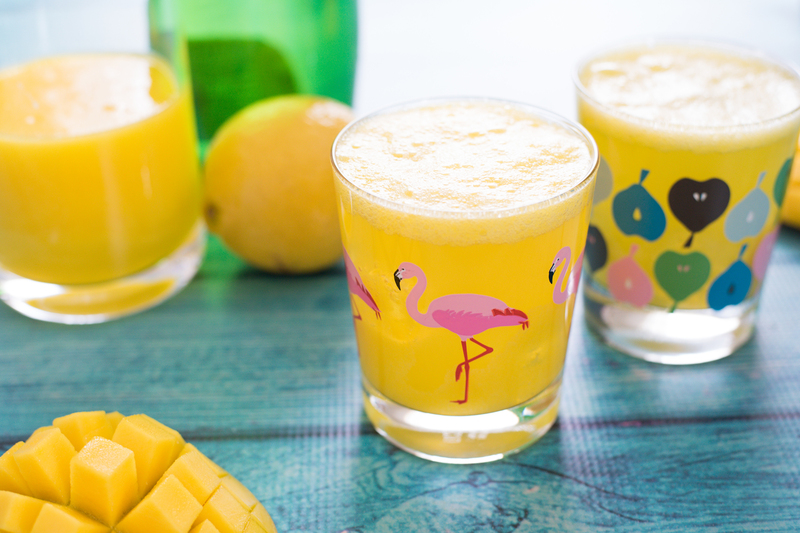 Get the Sparkling Mango Lemonade Recipe on Food Fanatic now! Lori loves lemons, English muffins, and her puppy, Izzy. She writes about all three on Foxes Love Lemons. If you love lemon too, you're going to love all of Lori's posts, because she's our Lemon fanatic!